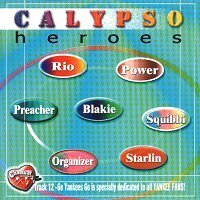 Calypso Heroes recommends itself by including Blakie, Stalin and Rio and the musicianship of Leston Paul and Kenny Phillips. Blakie's inimitable laugh accentuates the double entendre of his "Soccuyant" and "Current Gone". Stalin predictably gives you messages - "Mr. Panmaker" is particularly poignant in this 2002 remake. You move from the serious to smiles at Rio's "Big Shot Party" with all of its scatological insinuations. Preacher's rendition of "Calypso Travelling" is surprisingly up-lifting as his infectious and salacious "Proom Proom" is true to form. But all is forgiven in the latter's tribute to pan with real pan music. Consider these six songs the real buy and the other eight bonus tracks.